Our goal in Parks & Recreation is to keep a high level of maintenance on all city owned parks, sports fields & facilities. 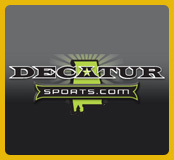 We host many fishing, soccer & softball tournaments in addition to Decatur Youth Soccer Association, National League Dixie Youth Baseball, American League Dixie Youth Baseball, Dizzy Dean Baseball & Northwest Baseball Leagues, Dixie Girls Softball League, Decatur Youth Football and many more community sports programs. The Maintenance Department maintains over 1,000 acres of sports turf, Parks, right-of-ways, ditches & alleys. In addition, our staff performs tree maintenance on all trees located on city owned property and right-of-ways. Other maintenance responsibilities include Carrie Mathews Recreation Center, Fort Decatur Recreation Center, Aquadome Recreation Center and Pool, T.C. Almon Recreation Center, Decatur City Cemetery, Garth Cemetery, Old State Bank, the Historic Railroad Depot and the Ingall's Harbor and Ingall's Harbor Pavilion. Our ballfield maintenance staff maintains 16+ soccer fields, 15 baseball fields, 13 softball fields and 2 football/soccer multi-purpose fields. We have hosted both the NAIA Softball & Soccer Tournaments at Wilson Morgan Complex and Jack Allen Recreation Complex. Our Park crew maintains over 125 acres in 18+ community parks located throughout Decatur. These parks include playgrounds, pavilion reservations for parties, tennis courts, basketball courts, splash pads and many more park amenities. Call 256-341-4930 for information on our parks. 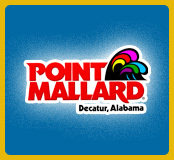 We take great pride in offering the best quality sports facilities & parks for the Decatur Community and the thousands of visitors who travel to Decatur for a sports related event or to enjoy the Point Mallard Water Park in the summer. 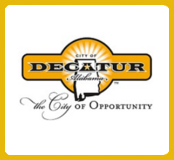 Take a look at what Decatur has to offer and we think you will find a city rich in community sports and fun!